Crystals | What is a Crystal? The word Crystal on it's own usually refers to Quartz. 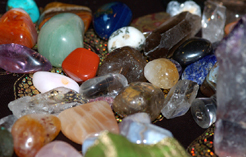 This includes Rock Crystal, Amethyst (and therefore Citrine), Rose Quartz, Rutilated Quartz and Smokey Quartz. Chalcedony is the name given to non-crstalline quartz, an example of this is Agate. Crystals as all matter are made up of atoms. Matter is made up of highly complex energy fields. Once it was thought that atoms were the smallest particles of matter. However, it is nowknown that atoms are made up of even smaller particles, Electrons, Protons and Neutrons. Through experimentation it has been found that Electronsare both particles and waves, both energy and matter. All Crystalline structures are formed of mathematically precise and orderly arrays of Atoms. For this reason Crystals will repond in unique and precise ways to heat, light, pressure and sound and can store immense amounts of information. This is why they can be used in industry. In liquid crystal displays (LCD) like TV's and digital watches. The quartz movement in watches. The first laser beam, developed in the 1960's used a Ruby crystal as a vital component.